I actually thought that this was an absolutely brilliant episode! I don't expect much from the wrestling that I watch on a weekly basis. All I ask for is that every segment that I spend time watching be meaningful. The spate of dissatisfaction that exists in the locker room must have urged WWE Creative to pull their socks up. 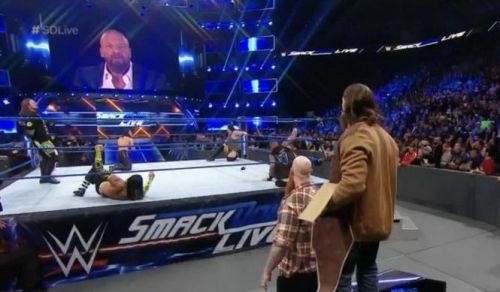 This week's episode of SmackDown Live had a real sense of urgency. There was not a single throwaway segment on the entire show. From the first moments to the very last, every segment had a purpose. I'm intrigued to see where everything leads in the build to Elimination Chamber and beyond. Chime in with your thoughts, comments, and opinions below. Let me know what you thought of the show this week too. Also let me know whether or not you agree/disagree with my analysis. We often accuse WWE of not pushing a star that is over. Rusev Day was a phenomenon not long ago, but WWE did not do anything with Rusev until it was far too late. The same could be said for Tye Dillinger who was misused so much that even the 'ten' chants from the audience stopped. I'm glad to report that Becky Lynch is getting the push she deserves. I don't know if it was a goof up or WWE intended it this way. But Becky Lynch pretty much confirmed in the first segment of the show that the women will indeed main event WrestleMania 35. The fact that they started the show with her also shows just how much faith they have in 'The Man'. It certainly does not help other superstars who have their segments hijacked by Becky Lynch chants. But I will take this over a dead crowd, quite honestly.